Bus Express is a bus company from Bangkok, Thailand with the headquarter located on Phutthamonthon 2 Hall Road in the Tawiwatthana District. The company provides round trips to Bangkok and Phuket, which are known as two of the most famous destinations in Thailand among tourists and locals alike. Bangkok is the capital city of Thailand known for its gorgeous shrines and lively streets, while Phuket is a province situated in southern Thailand and is the country's biggest island sitting on Andaman Sea. Keep in mind to book your bus tickets on Easybook website the next time you choose ride with Bus Express in Thailand. Both pick-up and drop-off point for the express bus is located at Southern Bangkok Bus Terminal. It is also known as Sai Tai Mai located at northwest of Bangkok, center on the left bank of the Chao Phraya River along Borommaratchachonnani Road. This bus terminal is one of three major bus stations in Bangkok and the second busiest bus station amongst them. There are many food stalls and shops in the bus terminal, so you can have a meal or do a little shopping while waiting for your ride. For Phuket, the pick-up and drop-off point for Bus Express is located at Phuket Bus Terminal, also known as Phuket Bus Terminal 1 or Old Phuket Bus Terminal. The bus terminal is located on Phang Nga Road in Phuket Town, which is one of the three main bus terminals available there. It also links Phuket to major destinations around Thailand such as Bangkok and Chon Buri since the buses travel to many local places within the country. Bus Express mostly arrives in double decker express bus, which are either equipped with 44 seats and 30 seats. The company is using "2+2" seating arrangement for their 44 seater buses and "1+2" for 30 seater buses. 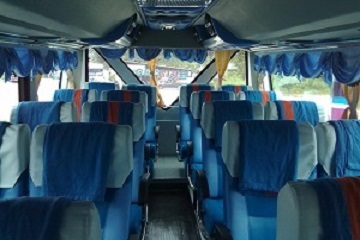 Passengers will be able to relax to enjoy the air-conditioning system installed in the bus coaches to have a pleasant journey especially during those long-haul rides away from the warm weather in Thailand. You know it will bring so much convenience when you can book Bus Express bus ticket online through Easybook website or mobile app. Whether you are heading to attend your best friend's wedding in Phuket or planning to shop till you drop in Bangkok, you can count on Bus Express to get you there safe and sound. Skip the long queue and book your bus tickets within a few minutes with Easybook now. 82/22 Moo 19 Phuttamonthon 2 Hall Road Thammasop Thawi Wattana, Bangkok.